We’d love your help. Let us know what’s wrong with this preview of Chaos by Lanie Bross. They kissed only once—and it was electric, like the air before a storm. But Corinthe and Luc broke the rules of the universe, and learned too late that their love would have consequences. In the dizzying aftermath, Luc refuses to accept his destiny—not if it means a life without Corinthe. As a fire rages through the Crossroads that connect wor Can they change their destiny? To ask other readers questions about Chaos, please sign up. Is there going to be a 3rd book? Lanie Bross's exciting follow up to Fates takes us right back to the world of Executors, Radicals and the Unseen Ones. A world where free will clashes with destiny and one's fate is written in the stars. A world full of magic and fantastical creatures where, again, we dance around the themes of forbidden love, fate and free will, all the while trying to keep up with the wild and eventful plot line. Corinthe is dead. Luc has managed to bring Jas back home and she doesn't remember anyt 3.5 stars. I remember reading Fates at the beginning of 2014 and really loving the spin on the Greek myth and the star-crossed lovers. I didn't think there would be a follow-up, but was very glad to receive an advanced copy of Chaos. I dived right into it, I couldn't wait to see where Bross would take us next. Initially, I was a bit surprised to discover Jas plays such a big part in the story and that we are mostly following Luc's perspective, but once I got used to that, I realized I actually liked getting to know them better and following their adventures. This time around we get to know more about the siblings and the dynamics in their family. We also learn more about the Unseen Ones and are introduced to a rogue Radical who ends up playing an important and emotionally riveting part in the story. I felt that I cared about the characters more, now, that I got to know them better, and I also felt that the conflict was more fleshed out and dramatic. And I really didn't mind not seeing Corinthe for the most part of the story. In Chaos we get to meet new characters and visit new, intriguing places. The world we were introduced to in Fates expands and gets even more interesting. We visit the Library of the Dead, Aetern (place of eternal life), Pyralis and the Crossworlds. We also spend quite some time in San Francisco. The jumps between worlds are many and they happen fast, making this a breathless kind of read - much like the first book, maybe even more. A lot happens in a short period of time, action races along at a near break-neck speed and while I enjoyed the thrill of it, I also kind of wished for more time to inhale all the new places and fully savor their uniqueness. Lanie Bross is amazing at developing new, vibrant and fascinating worlds, she cares about little details and makes the settings easy to picture, but she doesn't really give us time to fully appreciate her creations. Just when we get a good feel of one place, we jump straight into a different one. It's all a bit chaotic and dizzying, but perhaps this was the point. When I first read Fates by author Lanie Bross, I remember being immersed in a world that was unlike any other. It was fantasy mixed up with magic and teen drama and the kind of quick-pacing that made it impossible to put the novel down. After finishing Fates, I’ll admit I had no idea how the story would progress. With one of the main characters dead it felt like there wasn’t going to be much room to grow which made me excited to see what would happen in the sequel Chaos. Chaos takes place prior t When I first read Fates by author Lanie Bross, I remember being immersed in a world that was unlike any other. It was fantasy mixed up with magic and teen drama and the kind of quick-pacing that made it impossible to put the novel down. After finishing Fates, I’ll admit I had no idea how the story would progress. With one of the main characters dead it felt like there wasn’t going to be much room to grow which made me excited to see what would happen in the sequel Chaos. Chaos takes place prior to the events in Fates. Main character Luc is on a quest to bring Corinthe back to life no matter what the cost. And while he knows that the love he and Corinthe shared was a dangerous one with dangerous consequences, Luc is dead-set on having Corinthe returned to him. No price is too great. Meanwhile, Luc’s younger sister Jasmine is introduced to the story as a main character. Jasmine has no recollection of her time spent with Luc and Corinthe but everywhere she goes time seems wrong. She’s seeing strange things wherever she goes. Nothing is right but nothing is wrong either. Until one fateful encounter is all it takes for Luc and Jasmine’s paths to become crossed. I’m not going to lie I didn’t remember a fair chunk of Fates once I got to opening up the first chapter of Chaos. My memory was a bit iffy on some characters and how they had met Luc or what had happened to them in the previous novel. For the most part, Bross handled reminding her readers fairly well. However throughout reading I would periodically have to pause and wonder what had happened before Chaos in order to understand a scene or crack open Fates all together in order to get a feel of just what is going on. I personally loved getting to see Luc take charge and prove just how much he loves Corinthe. I’m not going to lie that in hindsight his falling for her in Fates was a bit unrealistic and didn’t seem very substantial but Bross does an excellent job at solidifying his emotions toward her character. Corinthe becomes more than just some mysterious girl and into someone that could be described as a soul mate. All the lengths that Luc goes to to save her completely won me over and broke my heart. All I can say is that Corinthe is one lucky lady. There are two new additions to the story. The first being Luc’s younger sister Jasmine being introduced as a new protagonist and the conflict from Fates crossing over and into Chaos. As Luc deals with the figures that stand in the way of his being reunited with Corinthe, Jasmine deals with the repercussions of what happened to her character in the last novel. All these new problems and added mysteries really took Chaos to new distances that left me awed. Once again, Bross does a stunning job at weaving a fantasy world that goes without compare. She describes to us a world that I would want to visit time and time again (if, you know, I would be guaranteed safe passage or something) and makes it come to life on the page. Readers who are big fans of fantasy and fictional lore will fall in love with the world that Bross has created. There is no denying that anyone who picks up a Fates novel won’t fall head over heels for Bross’s stunning world-building and unique characters. I would recommend the Fates novels to readers who are looking for a story that is half-teen fiction, half-romance and half-fantasy. Readers who previously read Fates should definitely continue the story and pick up Chaos. Any readers who want to fall in love with two characters while they fall in love should also give Bross’s novels a go. 'Chaos' is the second book in a young adult fantasy series that continues to explore the concepts of love, fate, destiny, and free will. The second book picks up where the first left off - after Corinthe and Lucas have kissed and broken the rules of the universe. Things are thrown into chaos because of their love, but Lucas refuses to give up and doesn't want any kind of future that doesn't include Corinthe. He must find a way to go back in time to save her - once and for all. The chaos that has 'Chaos' is the second book in a young adult fantasy series that continues to explore the concepts of love, fate, destiny, and free will. The second book picks up where the first left off - after Corinthe and Lucas have kissed and broken the rules of the universe. Things are thrown into chaos because of their love, but Lucas refuses to give up and doesn't want any kind of future that doesn't include Corinthe. He must find a way to go back in time to save her - once and for all. The chaos that has been unleashed by Lucas and Corinthe is being felt all over the world, including San Francisco, where Lucas' younger sister - Jasmine - begins noticing strange occurrences that shouldn't be possible. In the middle of her confusion and the chaos that has taken over her life, she meets the handsome and mysterious Ford. He's the only one who can explain to Jasmine what's happening and why - and to understand the various threads that connect everyone despite time, location, or any other obstacle. Will Lucas be able to find a way to save Corinthe once and for all, so they can finally be together without terrible consequences? Will Jasmine - with Ford's help - be able to help her brother and his cause? Or are all of their efforts for nothing? I found this to be an intriguing book that continues to mix mythology with deep life questions about fate, destiny, and true love. The main characters are both well written - Corinthe is an interesting female lead for the book. She's unique in so many aspects, yet easy to identify with at the same time. I enjoyed watching her relationship with Lucas continue to develop and grow throughout the story. I also really loved the introduction of the two new characters - Lucas' sister Jasmine and the mysterious Ford. Both pairs must learn to overcome obstacles and situations they never thought possible - all in the name of love. They each must answer the question of how far they will go for love. The author uses vivid descriptions and details throughout the story, so it was easy to envision myself beside the characters in their world. I loved learning all about Corinthe's world, along with all the other worlds that are discussed. Their intricate details and histories made the book all the more exciting and fun to explore. Aside from dealing with the mythology concerning the Fates, the book talks a lot about true love, fate, destiny, and free will. These are really deep topics and made me take a long and honest look at the various opinions about these beliefs as well as where I stand with them. It kind of blows our mind when you think about it, so I'm glad that the author wove the deeper topics into a lighter story about love and alternate worlds - it created a more even balance within the book to even it all out. Overall, I really enjoyed this book and I think it's a fantastic second installment in a romantic and thought provoking series. I definitely recommend this book - and series - to fans of mythology and YA fantasy with romance. Just finish this book, and I must say it was good, a little confusing in few chapters. It had a happy ending for Luc and Corinthe but what happened to Jasmine? Is the one that has me intrigue which I hope that the next book can explain more about Ford and how what radical he is? In this book we see Luc going thru the end just to Corinthe and his sister Jasmine, he wants both not one or there. In his journey, he faces with Miranda, Tess, and few executors. Luc finds the tunnels that Rhys has ment Just finish this book, and I must say it was good, a little confusing in few chapters. It had a happy ending for Luc and Corinthe but what happened to Jasmine? Is the one that has me intrigue which I hope that the next book can explain more about Ford and how what radical he is? In this book we see Luc going thru the end just to Corinthe and his sister Jasmine, he wants both not one or there. In his journey, he faces with Miranda, Tess, and few executors. Luc finds the tunnels that Rhys has mentioned, but he can't figure out how everything works. But on the other hands, he thinks that Jasmine is saved but she is not, she is going thru changes that she doesn't know why. Jasmine has changed, she knows it, but she can't remember what happened for two days, and now she wants to know why she can't remember, and she goes looking for answers. She meets Ford who helps her and saves her life but at the same time, she doesn't know who he is and but time keeps changing. She doesn't know why she travels far in time on one occasion that helps her understand. She finally returns from one of the time travel episodes and finally finds Luc. Luc was worry that she was still in danger, but Jasmine helps him understand more and everything that she is going. They complete the missing pieces in each other's stories which is good. In the end, time goes back and Luc can save Corinthe and Jasmine is save as well. But Jasmine knows, her hearts knows that she needs to go and find Ford. But before going anywhere, she decides to return something that needs help finding its way, and that is a firefly. This was completely and utterly different than the first one. This had like no connection to Greek mythology, so again, if you come to this series expecting that, you will be sorely disappointed. That said, this is still a pretty interesting book. After the events of book one, Luc is on a mission. Simultaneously, his sister Jas is on a mission, too, involving another Free Radical who may or may not be out to get her. We don't really find out, once things are wrapped up, because the book just end This was completely and utterly different than the first one. This had like no connection to Greek mythology, so again, if you come to this series expecting that, you will be sorely disappointed. Fates and Chaos are the first and second books of the Fates series by Lanie Bross and I have decided that I am going to do this review combining both books since I was able to read these books back to back. I have to admit, I enjoyed both books but I think Fates (book 1) edged out Chaos by a smidge. Please be warned – there are some things that I might mention that could be spoilers so definitely continue reading at your own risk. Fates kicks off the series by introducing the reader to Corinthe. I was immediately drawn into her story because of the way Bross introduced us to who she really is and although there are a number of other characters, this story really belongs to Corinthe. See, Corinthe was a Fate and has been exiled to Humana for the last 10 years and her role as an Executor has been to help fate along so that she could eventually go back to Pyralis Terra…or so she thought. Turns out she was really just a pawn in a larger objective that her Guardian, Miranda had been plotting in support of the rebellion. Miranda has invested a lot of time and effort into getting Corinthe to do what she wanted her to do and Lucas, who is introduced early on in the book, plays a large part in making sure Miranda’s plans work out. Miranda has tied their fates together by bringing Luc’s sister, Jasmine, into the mix and as he and Corinthe search for a way to save her. As the story moves along, we find out what Miranda is really up to but I think the thing I enjoyed most about this book was the world building that Bross did throughout as she described each of the worlds that Corinthe and Luc moved through in an effort to save his sister. We also see the way that Corinthe changes as she begins to realize she wants more than just to go back to her sister Fates…now she has realized that Luc is just as (if not more) important to her. As Fates comes to a close, things are a bit crazy for these characters and Corinthe gives the ultimate sacrifice to save Luc’s sister. With that in mind, Luc has decided he is going to do whatever he can to bring her back. Chaos is Luc’s opportunity to bring Corinthe back but there is an added twist. Because Jasmine doesn’t remember anything about what happened when she was taken by Miranda, she is unaware of what Luc has been up to. All she knows is that Luc is acting weird, her dad is going to rehab, and now there are some people she doesn’t know following her around trying to hurt her. As Jasmine tries learns more about what she missed during the days of her captivity and why time is jumping around so much, she ends up relying on a guy named Ford to help her out. He definitely has a story and we know very little about him. As the stories intertwine, the things Luc does have an impact on Jasmine as he causes time to jump around on her. The jumps help her figure out who she is, what is going on, and what she needs to do to get things back to normal. As for the characters, I liked Jasmine but I had a hard time believing that she is 15. Maybe the intent was to have her seem older due to the life she has had but she always seemed much older than her actual age. Ford was an interesting character as well. We don’t really learn a lot about him outside of the fact that he is a Radical who believes like Miranda does, that no one should dictate how others live or die. Similar to Fates, Bross does a great job of building out the worlds in this book. I also thought the story had some good progression. One of the things that does happen that did drive me crazy is the insta-love…both between Luc/Corinthe and Jasmine/Ford. I would have to say that I was a little disappointed with the ending. I found myself yelling "That's it?! Are you serious?!" It was one of those moments where I felt like I invested a day reading the story, fully captured in the plot and then the ending was just a slap in the face! How can someone end a story in that way?! For the full version of this review as well as others go to SleepsOnTables. Chaos starts off right where Fates left off. Corinthe is dead and Luc has miraculously brought his sister, Jas, back home. Luc is struggling with the loss of Corinthe and is hell-bent on finding a way to turn back time and bring her back. Jas knows something happened to her but she doesn’t remember what. As Luc embarks on his search, weird occurrences are happening to Jas and without Luc there to explain, For the full version of this review as well as others go to SleepsOnTables. Chaos starts off right where Fates left off. Corinthe is dead and Luc has miraculously brought his sister, Jas, back home. Luc is struggling with the loss of Corinthe and is hell-bent on finding a way to turn back time and bring her back. Jas knows something happened to her but she doesn’t remember what. As Luc embarks on his search, weird occurrences are happening to Jas and without Luc there to explain, she takes matters into her own hands to find out the truth of everything that has been going on in her life. If you remember correctly from my review of Fates, I wasn’t a big fan. I generally liked the book but found myself confused sometimes. Despite that, I decided to give Chaos a try. Unfortunately, I found myself getting confused all over again. As with Fates, I liked the spinoff and unique take on mythology and the whole notion of star-crossed lovers. For me though, there’s a certain level of execution that is missing from this story to pull it all together in a nice little bow. The world of Fates, the world that Corinthe comes from, expands even more in Chaos. One of my issues with Fates is that there wasn’t much description of this world and I found it hard to grasp. In Chaos, we get some explanation that makes the different worlds a little easier for me to grasp but then the questions comes up, is that explanation enough? For me, it wasn’t. I wanted more and to understand it better. Another little issue I had with Chaos is how fast-moving the pace of the story is. Maybe this is why I found myself easily confused when it came down to world development. By the time you’re sort-of-almost understanding what heck and where the heck, Luc is on his way to a whole new world where you have to re-understand all over again. If more time was taken in each little world–granted I do know that the quickness of travel is sort of a large plot point–I feel like I would’ve been more satisfied with how Chaos read. The really good part about Chaos is the new characters that we meet. In Chaos we learn more about Jas and the role that she is going to play. Even more exciting is that characters we’ve heard secondhand about from Corinthe and her life as an Executor come into play and intermingle with both Jas and Luc. While the main goal that we were left with at the end of book 1 is not resolved in book 2, there’s progress made by Luc and a lot of useful knowledge gained. We’re also faced with what is going on with Jas and a certain someone she meets and the roles that the both of them play in the grand scheme of everything. Chaos, like Fates, I found very interesting in terms of the concept, but there were parts of it that I wish were done a bit differently. Overall, I think Chaos was a good follow-up and enough happened to pique my interest about what happens next. Jasmine is back on Earth after Luc saves her from death in another realm, but her life had to be replaced by the life of Corinthe. Jasmine is unaware of what has happened, but she wakes up with very heightened senses, not understanding why she feels so different and has a new awareness of everything around her. Luc decides he will do whatever it takes to go back in time and rescue Corinthe, so he travels back through the Crossroad to other worlds, attempting to figure out a way to get back to when Corinthe was still alive. The only problem is that every time he changes the present, Jasmine passes out and wakes up on whatever day he has brought back. She has no idea why she continues to experience these strange events, but after she meets a mysterious man named Ford and gets sent back in time. she learns that one of the Executors (who carry out the will of the Unseen Ones) was actually her grandfather. She also feels a strange connection to Ford, and they begin to fall in love as they meet on various days and times. Luc finally finds a way to go back in time and save Corinthe, but this changes the future enough the Jasmine can no longer be with Ford. Jasmine and Luc are the only characters whose motivations are revealed in any depth, so the reader doesn't get to know much about most of the characters. Also, much like the relationship between Corinthe and Luc, the relationship between Ford and Jasmine seems far too quick and intense. It's hard to know what it's really based on other than initial feelings of chemistry or attraction--do they really know each other well enough to know that it's worth attempting to the entire course of time for each other? I had a lot of problems with Chaos, the sequel to Fates, which I found to be an interesting book with some faults. However, Chaos felt like actual chaos to me and while I will admit that it is an addicting read (I read it in one sitting) I found it to be lacking in some areas. I hoped Chaos would be better than Fates, with more fleshed out backstory that felt solid and that it would add some depth to the characters and it didn’t quite hit that mark for me. It picks up right after Fates ends and we’re treated to the prospect that Luc’s sister Jasmine is now in mortal danger. What he does next (within the first few chapters so not a spoiler really) blew my mind…he leaves her by herself so that he can find a way to turn back time, save Corinthe, and fix everything. This is not the only time I had trouble understanding the motivations that drove the characters forward. In fact Luc pretty much confounded me the whole time, and I enjoyed Jasmine’s part of the story much more. I liked getting to know her better, I can’t say I know her well or that I connected with her. There are lot of twists in the plotline that I thought were really interesting, and I did appreciate the way the author showed the duality of the characters who were supposed to be on strict side of the war. The writing style and plot flow quickly and I had no trouble getting through this one despite the lack of connection to the story, because there is truly very few dull moments to be had in this one. As a reader I personally love world building, even if it takes it’s time. I want to be able to see the worlds and appreciate them, and I think the lack of a solid world building foundation is what really threw me off with this one. There is also the dreaded insta-love, which is on my list of things I don’t enjoy. I will admit the two were cute towards the end, but I didn’t feel the spark they kept mentioning. CHAOS is the exciting and action-packed second book in a series about fate and love that takes readers on a journey through time and through worlds to find out whether love is strong enough to alter destiny. It is a suspenseful story filled with interesting twists, intriguing temporal paradoxes, and fascinating concepts about chance and destiny and balance and disorder. 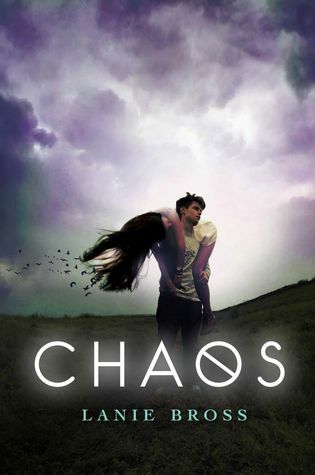 Picking up right where the first book left off, CHAOS follows Lucas as he attempts to fulfill his promise to Corinthe, Miranda a CHAOS is the exciting and action-packed second book in a series about fate and love that takes readers on a journey through time and through worlds to find out whether love is strong enough to alter destiny. It is a suspenseful story filled with interesting twists, intriguing temporal paradoxes, and fascinating concepts about chance and destiny and balance and disorder. Picking up right where the first book left off, CHAOS follows Lucas as he attempts to fulfill his promise to Corinthe, Miranda as she continues to seek revenge, and Jasmine as she tries to find out just what happened to her. New characters are introduced, new universes are explored, and new information comes to light about Jas and Luc, making this sequel an even more captivating installment than the first. Lucas swore he would find a way to get Corinthe back. With his sister safe, there is nothing left to stop him from trying to change the hand that fate dealt. But navigating the Crossroads and finding a way to reverse time might be too impossible a task. Especially without the help of the one person who was able to do what he so desperately wants to do. Even though the risks are great, the chance of success slim, and the likelihood that his actions will have unintended consequences, Luc has to try. He may have only known Corinthe for a short time, but already she is everything to him and worth throwing the world into chaos to save. He just needs to figure out who he’d be willing to sacrifice for her return. Author Lanie Bross built upon the ideas she introduced in FATES and created a story that is fast-paced, gripping, and incredibly entertaining. Developing Jasmine’s story arc in this sequel was a risky decision, but one that paid off. Her story is thrilling and full of surprises and allowed for the addition of an appealing new character. Adding time travel to the mix was another fantastic decision, giving the story layers, moments that wow, and giving readers plenty to think about after the story’s end. If you enjoy this review, please follow my blog at UtopiaNeverComes.blogspot.com - Thanks! I have always been a fan of books that have their base in Mythology (mainly Greek), so I was excited to read Fates when it first crossed my path earlier this year. I absolutely loved the story. As a Fate, Corinthe was tasked with sorting people's destinies into the right path. She was not allowed to ask questions at all. But when she becomes too inquisitive, she is cast out of her home wo If you enjoy this review, please follow my blog at UtopiaNeverComes.blogspot.com - Thanks! I have always been a fan of books that have their base in Mythology (mainly Greek), so I was excited to read Fates when it first crossed my path earlier this year. I absolutely loved the story. As a Fate, Corinthe was tasked with sorting people's destinies into the right path. She was not allowed to ask questions at all. But when she becomes too inquisitive, she is cast out of her home world, the only existence she has ever known, and sentenced to Earth. She now has to make sure that everyone's fate is followed according to plan. Book 1, Fates, had a lot of world jumping via the Crossroads to find Luc's sister, Jasmine. There was a lot of excitement, fighting, action, & suspense. There was also the inevitable love story between Corinthe & Luc, which all led up to death of Corinthe & the saving of Jasmine. Chaos begins right where Fates left off. The only difference is that we read the story in the eyes of Luc & Jasmine alternately. Luc wants to fulfill his promise to Corinthe & find a way to be with her, even if he has to turn back time to do so. Jasmine has lost days from her memory & when Luc runs off, she goes in search of a way to recall what she has lost. Now that Jasmine has been saved, the Unseen Ones send out Executors to hunt her down, because even though she was brought back to life, her fate is still to die. Where Fates is full of World-Hopping, Chaos has a lot of Time-Jumping. While Luc is searching for Corinthe, Jasmine is running from Executors. Every so often, she blacks out & finds herself in a different day. There is a lot of back & forth, which is much different than the fluid grace of the adventure in book 1. But this book introduces a new character & love interest for Jasmine, Ford. Jas is home but Luc isn't so sure her safety is guaranteed. An attack by two Executors cements his concerns but he needs to find a way to try and save Corinthe before it's too late. Considering Jas has no memory of her time with the Blood Nymphs, Luc believes she'll be safe hidden away with their aunt until he can return. But as he travels again to the worlds accessed via Crossroad in search of a way to bring Corinthe back from the dead, Jas is searching for something too: the truth about what h Jas is home but Luc isn't so sure her safety is guaranteed. An attack by two Executors cements his concerns but he needs to find a way to try and save Corinthe before it's too late. Considering Jas has no memory of her time with the Blood Nymphs, Luc believes she'll be safe hidden away with their aunt until he can return. But as he travels again to the worlds accessed via Crossroad in search of a way to bring Corinthe back from the dead, Jas is searching for something too: the truth about what happened during the two days she seems to have completely forgotten. Jas's quest brings her straight to Ford and right back into the crosshairs of the Executors. As with the first book, Bross's breathtaking world building is the true stand out here. All of the little details that bring these varying settings to life are so vivid and unique. And yet again I wished we could spend more time in them. In Chaos we travel to a library of the dead, where each tome is the story of someone's life; Aetern, a world made of glass; and Pyralis, both past and present. What I didn't love in this second installment was the really heavy handed instalove. I'm not as down on instalove as some, but it does have to have SOME set up. The way Jas just falls for Ford just by laying eyes on him was a definite stretch for me. That said, I loved Jas's part of this story. In fact, I found her to be somewhat more intriguing than Luc's bouncing around trying to figure out how to manipulate time. Jas has manifested powers thanks to drinking from the Flower of Life. She also finds out something very interesting about her and Luc that could have big repercussions down the line. Once again, Lanie Bross proves she has what it takes to tell an amazing story. Chaos takes up literally right after the events of Fated. So if you haven't read Fated, this book will NOT make sense. After Corinthe dies in his arms, Lucas makes the decision to defy the universe and turn back time to rescue the woman he loves. But even the smallest changes to the threads of the universe has rippling consequences across time and space. What price is Lucas willing to pay to bring Corinthe back from the Once again, Lanie Bross proves she has what it takes to tell an amazing story. What price is Lucas willing to pay to bring Corinthe back from the dead? Like Fates before it, Chaos answers questions and leaves as many questions. If fate is set in stone are Lucas actions preordained? Or can fate be changed? Were those changes meant to be or has Lucas set in motion events that could unravel the fabric of the universe? After Corinthe's death, Luc is determined to bring her back. But while he dives into the Crossroads to change time, his sister Jasmine experiences odd changes and meets a mysterious boy who may be her only hope to save her life. Messing with time is always confusing, and this book is no exception. Between the dizzying nature of the Crossroads and Jasmine jumping through time, I really couldn't keep much straight. The book lived up to its title, as I just hung on for the ride. There are a few inte After Corinthe's death, Luc is determined to bring her back. But while he dives into the Crossroads to change time, his sister Jasmine experiences odd changes and meets a mysterious boy who may be her only hope to save her life. Sometimes I read a book and it doesn't sing to me, but if it is part of a series I try (unless it was just not meant to be)to give it another shot. That is what happened here, and unfortunately it wasn't my cup of tea again. I can't say I will read the next book, the series just doesn't compel me to get lost for 4 hours. Wow. Sometimes I wish I could turn back time but this book definitely shows me that that would be the worst way to go. It was an amzing book and the story was engaging. This was definitely a perfect ending to a series. i loved it, it was amazing. so beutufully wrote. yes, i admit i was bored a few times but when i turned the page i was realed back into this exqistite book. Excited for last book in the series. Hopefully coming before next year!